Many holy women followed Jesus to the mount of Golgotha, watching and weeping. Our Lord paused in His path toward Calvary and spoke to their hearts of the true horrors to come. He prophesied the evil that many would suffer and the sin into which many would fall. Jesus’ death is painful, yes. But the greatest tragedies are yet to come when persecutions will burn so hot against believers that the resulting fire will be like one fueled by the driest timbers. One of the holy women, Veronica, approached Jesus in silence. She removed a clean veil and carefully wiped His bloody face with it. This wordless act of love was received by Jesus with serenity. Posterity has reciprocated Veronica’s small act of charity by forever blessing and honoring her holy name. As our Blessed Mother stood before the Cross of her divine Son, she would have pondered the encounters these holy women had with her Son. She would have been filled with gratitude for the care and concern these women had shown to Jesus and she would have been touched by their compassionate tears. But she would have also reflected on Jesus’ words, “Daughters of Jerusalem, do not weep for me; weep instead for yourselves and for your children.” Mother Mary would have indeed taken these words to heart. Though her heart was filled with a holy sorrow at the Crucifixion of her Son, her deepest sorrow was for those who would reject the gift her Son was offering them. She would have been keenly aware that Jesus’ death was meant for all, but that not all would accept the grace that flowed from His perfect sacrifice. Mother Mary was aware of the fact that these holy women, and their children, would later suffer for their love of Jesus. They would be invited to participate in His own Cross in a more powerful way than the holy women first did on that Friday in Jerusalem. 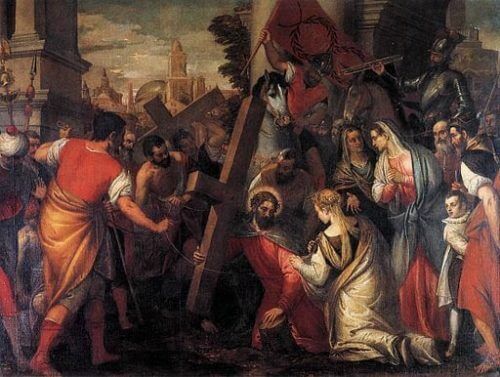 As these women and their spiritual heirs began to receive the Eucharist after Jesus’ Resurrection, and began to enter into a deep spiritual communion with Him through prayer, they would not only be filled with joy, they would also be compelled to carry the Cross of discipleship. Reflect, today, upon one “consequence” of being a follower of Jesus. If you choose to follow Jesus, you will also be invited to share in His suffering and death so that you may share in His Resurrection. Allow your heart to be filled with the same compassion as these holy women. Direct that compassion to those caught in a life of sin. Weep for them. Pray for them. Love them. Weep also for those who suffer on account of Christ. Let your tears be ones of holy sorrow like the tears that rolled down the cheeks of our Blessed Mother and these holy women of Jerusalem. My sorrowful Mother, you watched as these holy women wept at the suffering of your own Son. You saw the tears they shed and the compassion they felt. Pray for me that I may also have holy tears as I see the suffering of the innocent, and fill my heart with compassion and concern. Loving Mother, pray also that I may have a heart of sorrow for those who live in sin. Your Son died for all, but many have not accepted His mercy. Let my sorrow for sin be converted into tears of grace so that others may come to know your Son through me. My merciful Lord, may I see Your agony and death as the glorious means of salvation for the world. Fill my heart with true sorrow for those who do not open themselves to Your love. May that sorrow become a means of grace and mercy for those who are most in need.